With nearly three decades of medical experience, Dr. Rachel Levine is ready to become her state's next top doctor. 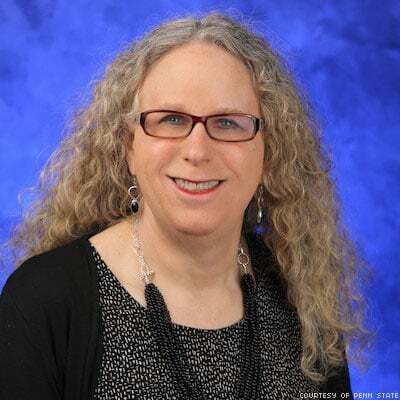 Dr. Rachel Levine is poised to become the highest-ranking out transgender woman in Pennsylvania's state government after being selected by Gov.-elect Tom Wolf as his physician general, reports Philadelphia magazine. Wolf publicly announced several members of his cabinet Saturday, all of whom are still awaiting confirmation by the Pennsylvania Senate before assuming their new positions. If confirmed, Levine will be advising the governor and the state's Department of Health on medical and public health-related issues. In a statement announcing the nominations, Wolf commended Levine's nearly three decades of experience in pediatrics, psychiatry, and behavorial health, saying, "It is important to me that we place equal emphasis on behavioral and physical health issues." Levine is a leader in treating teens with medical and psychological problems as well as both children and adults with eating disorders, according to Philadelphia. Levine currently serves as professor of pediatrics and psychiatry at Pennsylvania State College of Medicine's Hershey Medical Center, as the LGBT Liaison for Hershey's Office of Diversity, and on the board of statewide LGBT rights group Equality Pennsylvania. Speaking to Pennsylvania newspaper The Patriot-News about how "meaningful" her nomination is, Levine explained that being transgender has given her a unique perspective that aids public health. "I think [being trans] has helped me in terms of the LGBT community in terms of understanding what all the issues are," she said. "And I think I've been able to serve as a mentor and role model to LGBT individuals at the medical center as well as in the community." The Pennsylvania State Senate next convenes Monday.